MainAll NewsMusic & EntertainmentWhat's a nice Jewish boy doing playing a neo-Nazi? What's a nice Jewish boy doing playing a neo-Nazi? In his new film, Daniel Radcliffe plays FBI agent Nate Foster, who goes undercover to take down skinheads planning to set off a dirty bomb. Daniel Radcliffe in a scene from "Imperium." 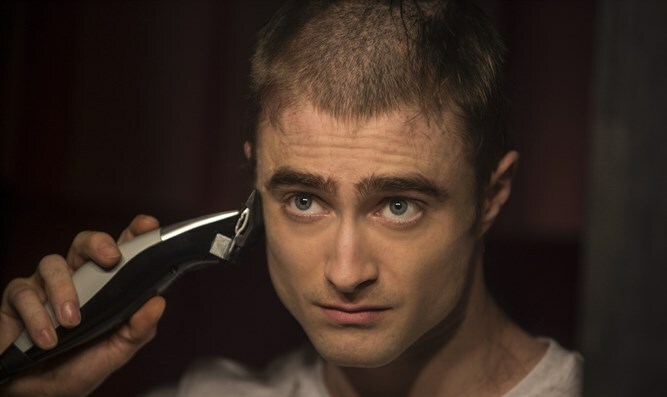 (JTA) -- In his new film, "Imperium," Daniel Radcliffe plays FBI agent Nate Foster, who goes undercover to take down skinheads planning to set off a dirty bomb. "Imperium" is loosely based on the experiences of FBI agent Mike German, who spent 16 years with the bureau, a dozen undercover. German co-wrote the screenplay with director Daniel Ragussis. Both Daniels are on the phone to promote the enterprise, one definitely more tired than the other. Radcliffe’s critically acclaimed, sold out off-Broadway play "Privacy" had closed the night before, followed by an apparently lengthy closing night party. But despite the joking promise that his exhaustion might lead him to reveal something juicy -- “You never know what I might say” -- Radcliffe stays on message, painting a self-portrait of an intelligent young actor who has survived fame without a semblance of pretense or affectation. On the face of it, Radcliffe does not seem the obvious choice for the role. For one thing he’s a Brit, though you couldn’t tell by the mid-American accent he adopts for the film. And for another, he doesn’t fit the burly Jason Bourne tough guy image we’ve come to expect from our movie heroes. But that’s exactly what led Ragussis to cast Radcliffe. “When I first met Michael German, he was so different from the prototype FBI agents,” Ragussis said. “He was very intelligent, a soft-spoken guy who studied philosophy in college. I spoke to him and said you’re not what I expected. In fact, Radcliffe’s relatively small stature -- he is listed as being 5-foot-5 -- only ratchets up the tension as Nate Foster is forced to use intelligence to ingratiate himself within various extremist groups and maintain his cover. Radcliffe's nuanced performance as an agent with no field experience who has jumped into potentially volatile waters without a life vest almost certainly will win critical raves. His character must do battle not only with the Nazis and Klansmen, but his own superiors, who at a critical juncture want to pull him out, believing he is on the wrong track. Radcliffe said he "was lucky to have Dan here with me." He also shaved his head on screen, wore Nazi regalia and of course offered the Nazi salute. That brings us back to grandma. Radcliffe said his maternal grandmother -- he never knew his granddad -- “was an evacuee during the war,” taken to the country to stay with people away from Nazi bombers. He recalls her telling him stories “about how our family came to the UK and where we came from." It is the reason he believes "Imperium" will not be appropriate for grandma. Radcliffe finds it impossible to define how his Jewish heritage impacts his work. Considering the film’s topic, our conversation inevitably turned to America’s gun culture. “The gun thing is alien to me,” Radcliffe said. “But I don’t think I was in Virginia” -- the film was shot in Hopewell, a small city south of Richmond -- "for more than a day before three separate people said, 'hey, you’ve got to come shoot with us.' I’m up for anything and I had a lovely day, but that’s never something I’m going to get used to. Radcliffe then mentions Jodie Foster, Elijah Wood and Toby Maguire as positive role models for American actors. Like them, Radcliffe has literally grown up in front of us, although to a degree none of them could match: He starred in eight "Harry Potter" films in 11 years, starting at age 11 and finishing at 21. While one of the rules for this interview was no questions about the new "Harry Potter" play and book -- Radcliffe had nothing to do with either -- the old films were not out of bounds, And, no, there are no regrets. Still, Harry Potter will always be with him. Even today, five years after the last film was released, a writer who shall remain nameless will talk about his granddaughter Samantha, who is a big fan and celebrating a birthday and can Daniel send a photo? Of course, he can -- a promise stars make all the time but seldom deliver.